The true story of Ali Baba: how he defeated the evil magician Harri Pottati, rescued the beautiful Sugaree Sweet, made friends with a monkey and had a brew in ‘Ava Bru. Front of House Hazel Galvin & co. 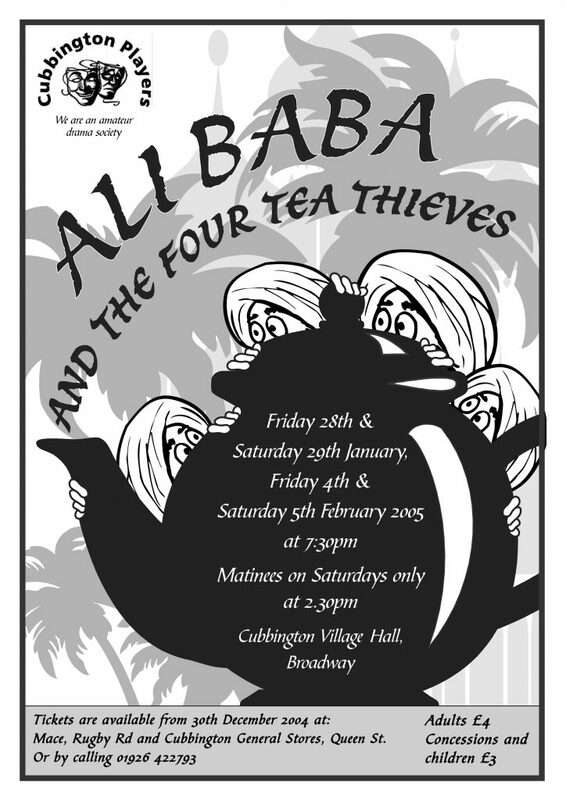 Squeezing Ali Baba and his 40 thieves onto the stage at Cubbington village hall was going to be a tall order by any stretch of the imagination. So instead we were treated to four tea thieves and their escapades in the land of ‘Ava Bru, as part of the Cubbington Players’ annual pantomime performance. The village hall was pas for Saturday’s matinee with extra chairs being dragged out to accommodate the numbers of families wanting to join the fun. Pete Pawson got the afternoon’s entertainment off to a start in the role of Mustafa Pint and his rendition of Peter Andre’s Insania. A favourite with the audience, he acted as the show’s storyteller and his comic relationship with his nagging wife and his resulting injuries created many a laugh among the crowd. The traditional boos and hisses wer instigated by the evil wizard, Harry Pottati, played by Phil Kohler with great effect. And his bumbling tea thieves – Earl Grey, Typhoo, Lapsangsingsong and Lipton were well received by the audience. And no pantomime would be complete without its dame. Dame Wobblebotham, Ali Baba’s mum, played by Paul West, provided some great comedy moments. The performance was slightly rough around the edges at times, but no-one seemed to care. If anything it endeared the actors to the audience even more, community theatre at its best.